To change the size of the picture within a preset placeholder or frame, select the photo, click the paintbrush at the top of the screen, edit mask. You can also choose whether you want the photo or the text in front. Dropbox is a great tool for sharing, syncing, and saving files. It creates a new kind of folder on your computer. When you save or drag and drop photos, videos, or documents into that folder, they are automatically available on all your computers and phones. There is no uploading and downloading involved. It is as simple as saving the file or dragging and dropping it into your Dropbox folder. You can also share a Dropbox folder with another user to easily share files. The basic Dropbox account is free and gives you 2Gb of storage. It can be installed on every computer you own. If you are not near your computer you can log into your Dropbox account on the web. Go to https://www.dropbox.com/ to try it for free! Resources for Creating "Web Trips"
Imagine that you have a collection of websites that you want your students to visit. There are many ways to get the links to students rather than having them type in each one individually. You could create a Schoolwires webpage of your links or you could use one of these web resources. Stich.it is a service that lets you “stich” almost anything together on the Internet. That means that you can quickly and seamlessly create a slideshow-like experience that can include Web pages, video, music, photos and more. You can even add annotations to each page. Use this to give your students a task for each site. All you need are links! Fav7 is a service that creates a single page for up to 7 URLs. You just enter the addresses you want your students to visit and the site gives you a single, short URL to a landing page with screenshots of each URL. 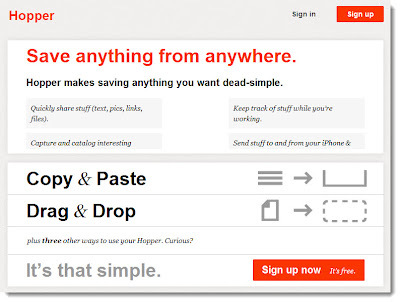 Hopper is a super easy way to get text, links, photos or files from your desktop computer to an iDevice. This would be a great way to get information to student iPads quickly and easily. Simply create an account with any email address, paste the desired data to your "bin" and then access your bin on any other computer or iDevice. 1. Go to http://gethopper.com and create an account. For those of you using iPads in your classroom, use your iPad set's email address and create a password that you can give to your students. 2. Once you're logged in, either copy/paste or drag/drop text, links, files or pictures to your "bin". 3. Students then go to http://gethopper.com and login to the class account. Students will see any text or files that you have pasted in your bin and can access or save them to their device. "What time would you travel to?" "How much rain can a cloud hold?" "If blood is red, why are veins blue?" Dear iWork.com user, Thanks for participating in the iWork.com public beta. We all know and love to use Wordle to create cute word clouds, but it can take the kids a while to type, even if they are copying and pasting. Enter Wordle: Advanced! 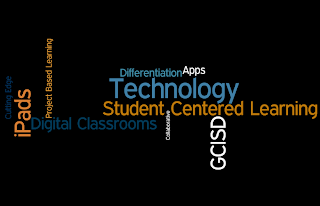 This is the last tab across the top on the Wordle site (direct link: http://www.wordle.net/advanced). How easy is that? Such a time saver for the younger students! Give it a try!